This project is on hold because the door bells at the front door will possibly be re-arranged into a single door bell panel for all users in the building. This project is about a display at the front door. Its purpose is to alert visitors to the RevSpace door bell and display a short message. 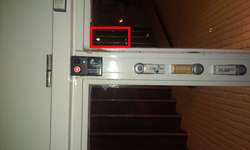 For example: when expecting a pizza delivery, the display could show (alternating): PIZZA, BEL and an arrow indicating the door bell. A simple prototype has been built out of an arduino and two 8x8 LED matrix displays, giving a total pixel area of 16x8 pixels. The prototype scrolls a simple messages from right to left. The font used is an MSX-like font using characters of 6x8 pixels, so almost 3 characters can be shown at a time. By attaching red vinyl foil to the matrix displays, it looks quite nice, hiding the LED pixels when they're off. It has not been decided yet where and how to mount it exactly. My idea is to put it on the glass on the inside, next to the door, just above the door bell. Possibly laser cut a simple case for it. Another question is how to power it (we only need power since the data interface is wireless). An interface should be made to customize the text displayed (to say ROTI, CHINEES, ETLI EKMEK etcetera), possibly using the existing NRF24L01+ network as the physical layer. Obviously it should be possible to disable the display too. It should be easy to set the text from within the klusbunker. This page was last modified on 9 May 2017, at 10:09.